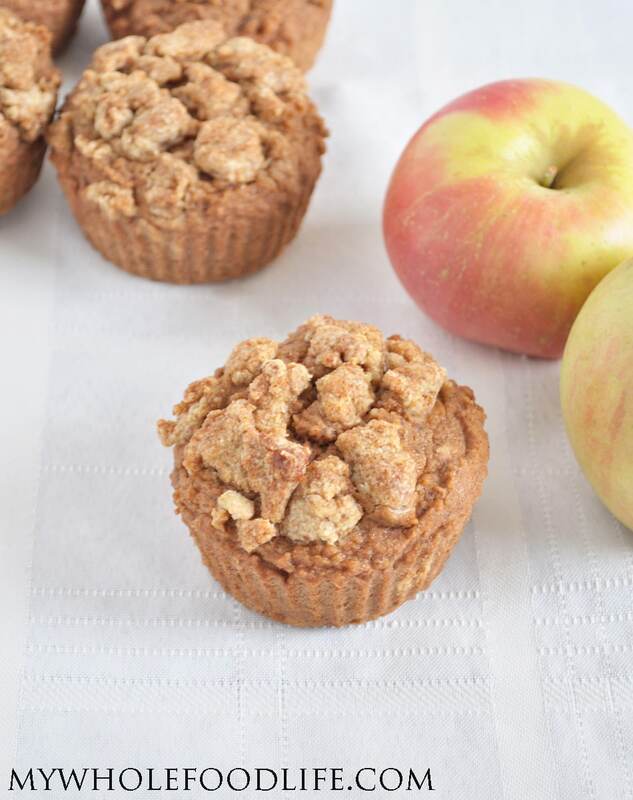 Apple Spice Coffee Cake Muffins. The other day I had a reader ask if I had a gluten free apple muffin. I did not at the time, so that is why I created these Apple Coffee Cake Muffins. 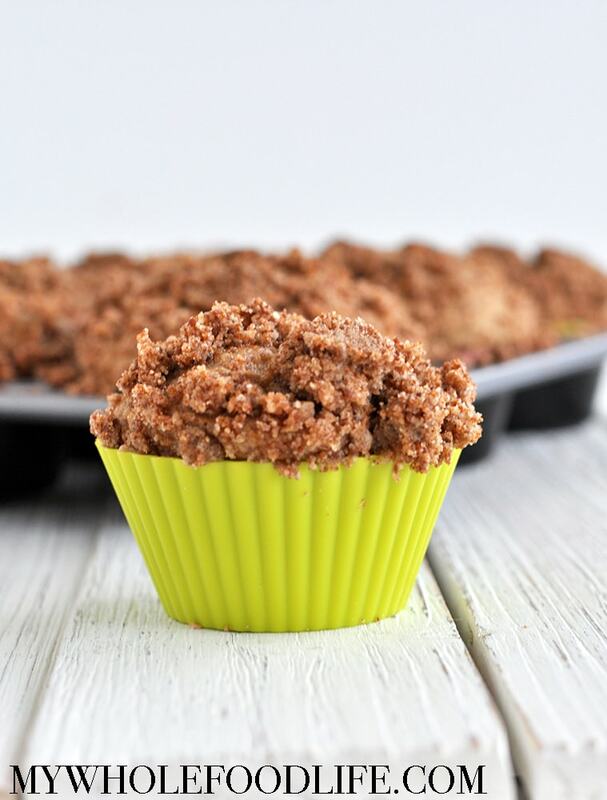 These apple spice coffee cake muffins are good with or without the crumb topping. In fact, they are completely oil free if you skip the crumb topping. I did half with and half without and both ways are delicious. The applesauce in this recipe keeps these super moist. My daughter kept trying to sneak some when they were cooling! If you like apple treats you may also enjoy my healthy apple cobbler and my healthy apple pie. I made mine into jumbo muffins, but you can also do standard sized. You may need to adjust the cooking time though. These muffins freeze great so you can make a big batch and freeze for those busy mornings. 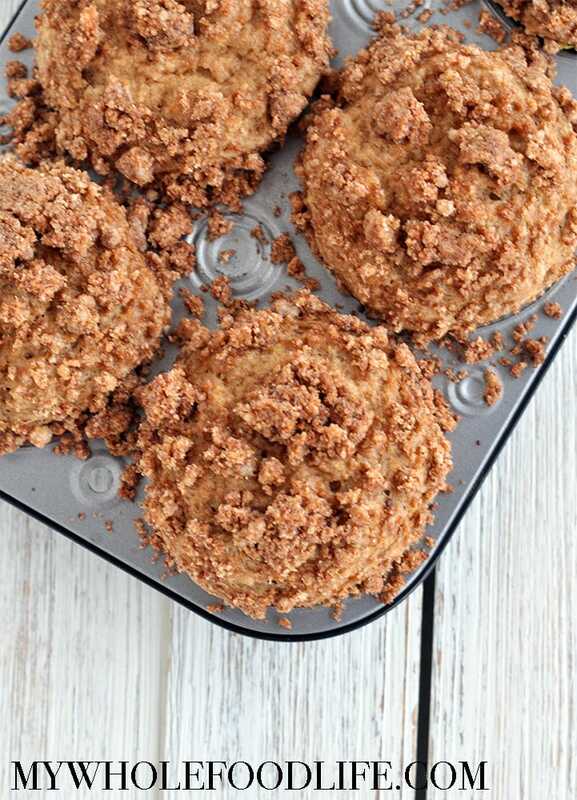 It's like having coffee cake in muffin form! Gluten free and vegan. Mix all the dry ingredients for the muffins in one bowl . Spoon batter into lined muffin cups. I used silicone muffin cups . If you use paper muffin cups, you will need to spray them with oil before adding the batter in. This will prevent them from sticking. To make the crumb topping, mix all topping ingredients in a bowl. Once everything looks like it's clumped together, sprinkle a little over each muffin. I used jumbo muffin cups and baked mine for about 20-25 minutes. If you use standard sized muffin cups, you can probably bake these in half the time. Let the muffins cool completely before removing from the muffin pans. Store these muffins in the fridge. They should last at least 2 weeks. You can also freeze them for longer storage. Enjoy! These are great! A perfect little treat. The coffee cake topping was delicious. I’m going to double that next time! So glad you liked them Shari! It's one of my favorite muffin recipes. I was thinking it would be amazing as a cake in a loaf pan. Do you know if that work and at what time and temp? I would love to bring that to parties. It would look so fancy! These look great! With the crumb topping, how can you tell when the muffins are done baking (as to not over bake or burn)? Also, should the instructional video be on this page or is it your YouTube page instead? Thanks! Thank you!! The video is in this post just above the recipe card. You can tell they are done with a toothpick comes out clean. Thanks Melissa! There's a line mentioning the video, but it doesn't show. However, it's probably just my browser. Thank you for the tip, excited to try this recipe!